This 1.6kW system is designed for weddings, private parties and fund-raising or other social events. It combines microphone mobility and high intelligibility (for announcements, speeches, or DJ commentary) with the extended bass response needed for high quality disco or dance music. 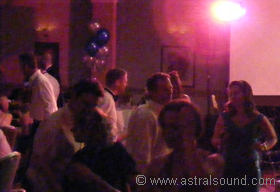 It is adequate for events with between about 50 (teen drum 'n' bass) and 250 (wedding party) guests, and can be supplemented with additional loudspeakers where higher volume is required. Spare audio inputs on the mixer allow for iPods, laptops or other audio sources (cables for this are included). A range of supplementary disco equipment is available (including crossfade mixers, vinyl decks or CDJs), as well as disco effects lighting and DJ monitors. From £225.00 + VAT (£270.00 including VAT) per day, including delivery1. Marquees up to about 750 square metres. Can be used with additional equipment for live music (e.g. wedding band and iPod disco). The EFX-12 is an excellent small-frame mixer. With 12 mono + 2 stereo channels it has all the facilities and controls you need, but is simple to use as a simple level control if that is all you need to do. If you need to deal with feedback, or simply to change the overall tonal balance, the included dbx 231 - with 2 × 31-bands, +/-6 or +/-12dB, and high-pass and bypass functions - makes it easy to do. Effects are not generally requested with this system, but the EFX-12 has two configurable channels of Lexicon effects if they are required. The F10, from Martin Audio's acclaimed Blackline range, provides a clear and natural mid/high-frequency complement to the S15's deep and powerful bass. This is the way bass is supposed to sound! This fully-programmable digital loudspeaker-management unit ensures that the amplifiers and loudspeaker system deliver optimum performance. One for the bass speakers, another for the tops. Bi-amplification provides substantial audio improvement compared to passive loudspeaker systems. Each QSC PLX1804 amplifier provides 2 × 550 Watts (FTC, 20Hz - 20kHz, 0.05% THD) with the loudspeakers supplied: enough to deliver a full and powerful sound without distortion. The Sennheiser XSW Series are true diversity systems (with a choice of headset, lapel microphone, or handset), having the same microphone capsules as their evolution series stablemates. The Denon DN-C615 is simple to use, but has advanced facilities - including varispeed, autocue and single-track/continuous playback options - for situations where these might be called for. It can also play MP3 tracks from data-formatted CDs. All necessary power, signal and loudspeaker cables are included. Delivery, set-up, take-down & collection are included without extra charge anywhere within a 15 mile radius of Stroud (which includes most of Cheltenham and Gloucester, and much of the surrounding area). Extra delivery charges may apply over greater distances (see our prices page for details).